Clearly, we love being hauled out. Why else would be doing it just three months after the last time? At least this time our engine didn't stick in reverse and almost make us crash into nearby boats. So we have that going for us, which is nice. And our repair didn't compare to the damage to this boat sustained. She was on the lift when we arrived in Spanish Wells the first time (sooooo long ago it seems). The wooden platform at R & B Boatyard that lifted us out of the water is much different than the humongous travel lifts that we are used to. Basically you pull in over a big submerged platform that is then lifted up, with the boat on top. One of the boatyard owners (Robert, the "R" of R&B) dove down underneath the boat while the platform was being raised, to make sure everything was aligned and okay. We were successfully hauled out, but I think we were pushing the limits of the apparatus both in size and weight. There was only about 10 inches of clearance on either side of the boat. Then the winching motor shut down while we were being lifted but fortunately was able to be restarted. Up on the lift we had a great view of Spanish Wells. We were a bit higher up than our last haul out. 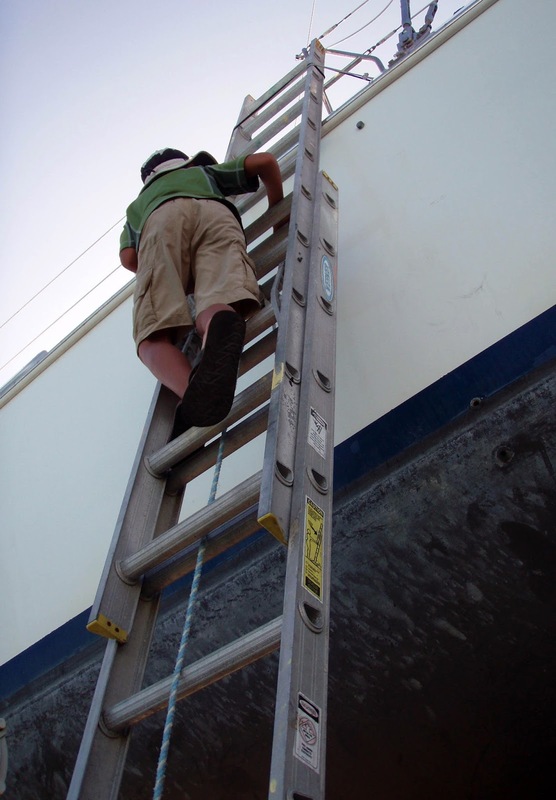 It seemed especially high because we had to climb to the deck boat instead of just the bottom of the swim step and the narrowness of the dock made for a very vertical ladder. But the boys handled it well and no one took flight. Fortunately, the area to be repaired dried out quickly and the team at R & B efficiently and expertly completed the fix. We were in and out in less than 2 full days at a very reasonable cost. We were pretty pleased with that part of the situation. Unfortunately, there were complications (there always are). Matt had also taken this opportunity to try and repair our starboard raw water pump (the thing that pumps the water to cool our engine) with a kit that R & B had been nice enough to get for us. It had been leaking sea water, which as you might have guessed is not desirable on a boat. After a local machine shop replaced the seals, the pump was leaking even worse than before. Apparently the shaft of the pump has some pitting. So we are currently waiting for a new pump shipped from the States. The last we heard, the part was on a plane in Governors Harbour and could make it here today. Or not. Then yesterday morning, we turned on the generator to make up for the relative lack of sun we have had. The freezer and fridge have been running full tilt to make up for being off for the couple days we were hauled. The generator ran for a bit and then began sputtering under load, like it wasn't getting enough fuel.